The honor of carrying the College of Arts and Sciences gonfalon and leading the student procession at the 2018 spring commencement was bestowed on Shanelle Briggs, a general studies sciences major who has been accepted to medical school. 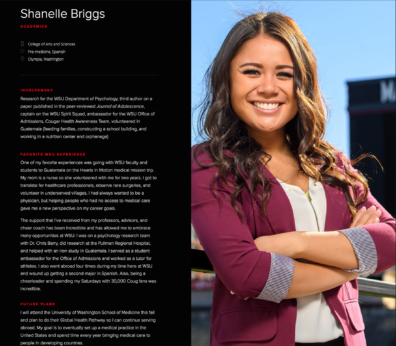 Her many accomplishments include CAS Outstanding Senior, WSU Top Ten Senior, co-author of three published research papers, captain of the WSU Spirit Squad, Cougar Health Awareness Team member, two-year Hearts In Motion volunteer, a 4.0 GPA, and more. “One of my favorite experiences was going with WSU faculty and students to Guatemala on the Hearts in Motion medical mission trip. My mom is a nurse so she volunteered with me for two years. I got to translate for healthcare professionals, observe rare surgeries, and volunteer in underserved villages. I had always wanted to be a physician, but helping people who had no access to medical care gave me a new perspective on my career goals. 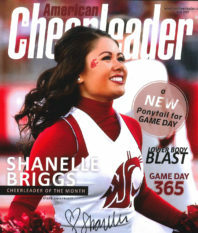 In addition to her academic and community service work, Briggs was featured on the cover of American Cheerleader magazine for the Fall 2017 issue and honored as Cheerleader of the Month. She will begin her medical school career at the University of Washington in the fall. Top photo: Briggs at the College of Arts and Sciences commencement ceremony on May 5, 2018.